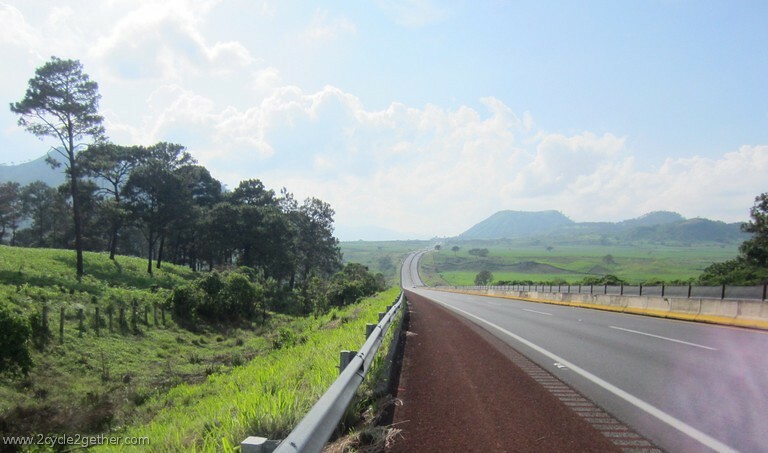 ←350 KM Pledge Riders :: THANK YOU! 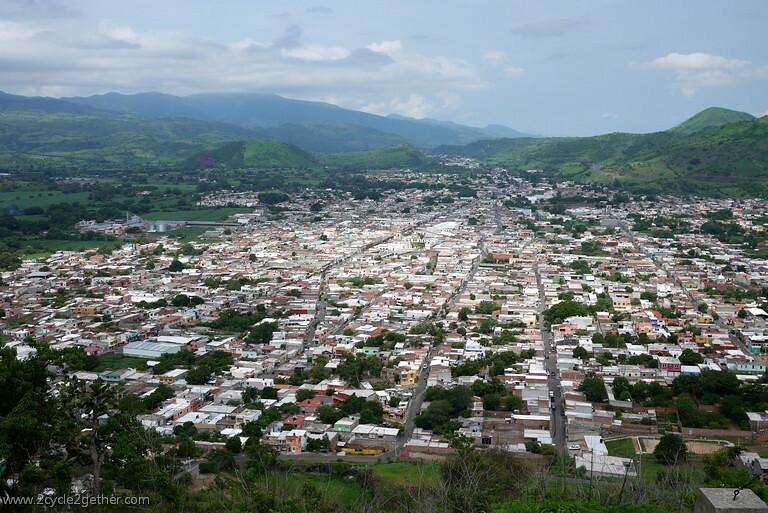 We leave Tepic with our eyes set on the town of Jala, a little over 72 kilometers away (~44 miles). Now that we are 3000 feet above sea level, the weather is bearable. But it doesn’t take us long to realize that we’ve traded insufferable heat and flat roads in for some climbing and heavy humidity. The day begins with a slow and gentle climb overlooking rich, dark green valleys. By mid-day the landscape is dotted with abrupt but neatly symmetrical peaks that jut up out of the ground. It’s sort of surreal looking and I can’t help but imagine a giant mole crawling around underground, responsible for making these perfect mounds. We’re cycling through a volcanic basin and before the day is done we’ll see two ancient volcanoes. 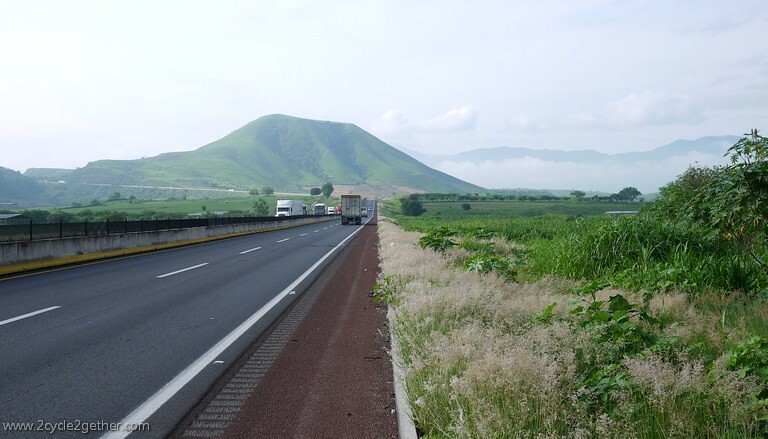 We pass by the Sanganquey volcano, outside of Tepic, at 2340 meters and just before Jala we see the Ceboruco (2280 meters), which buried an ancient city under it’s lava and volcanic rock. 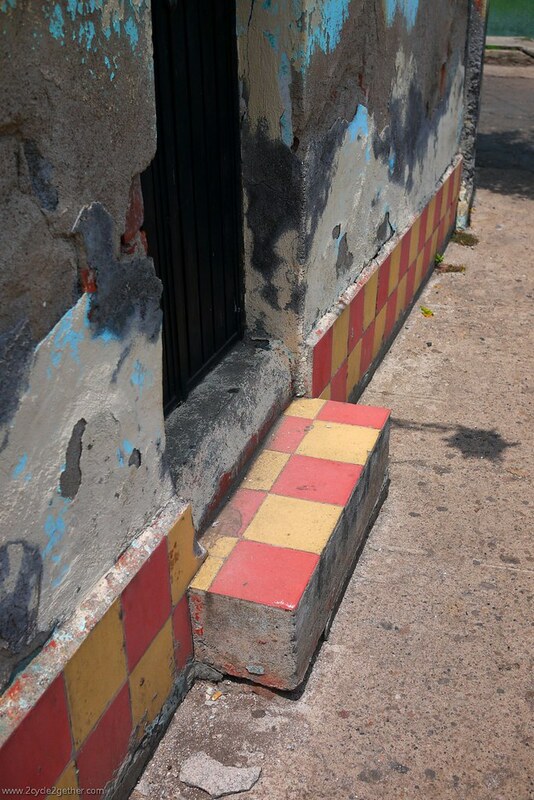 Housing on the south side of Tepic. 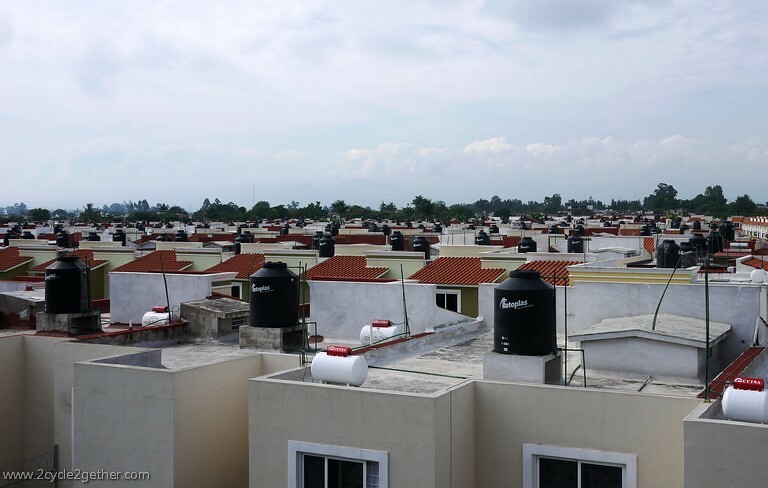 Gas and water tanks on rooftops. Lots of beautiful ups and downs. Interesting cliffs pop up out of nowhere. 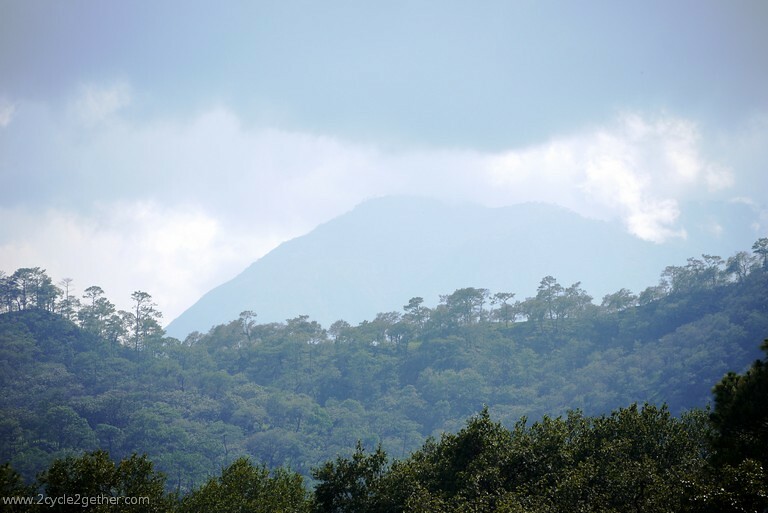 The Ceboruco Volcano comes in to view in the late afternoon. 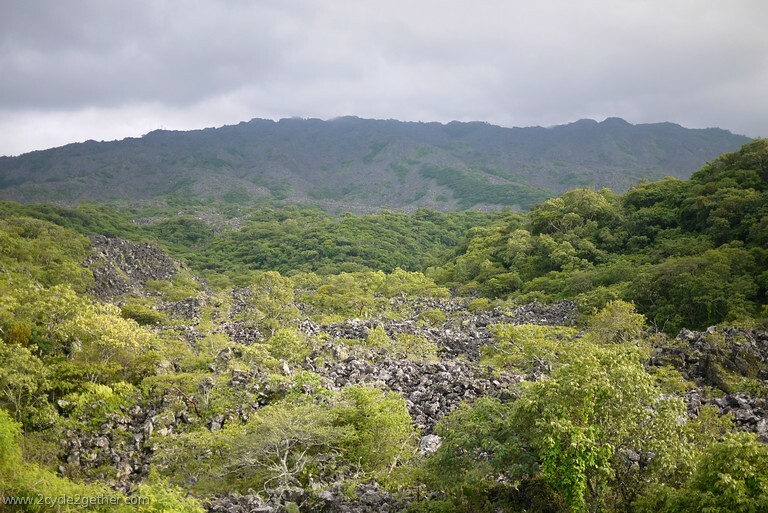 Surreal landscape for miles, lush vegetation growing out of the lava and volcanic rock. Sheila coming up over another climb. Thankfully we had cloud cover but it was warm & humid. 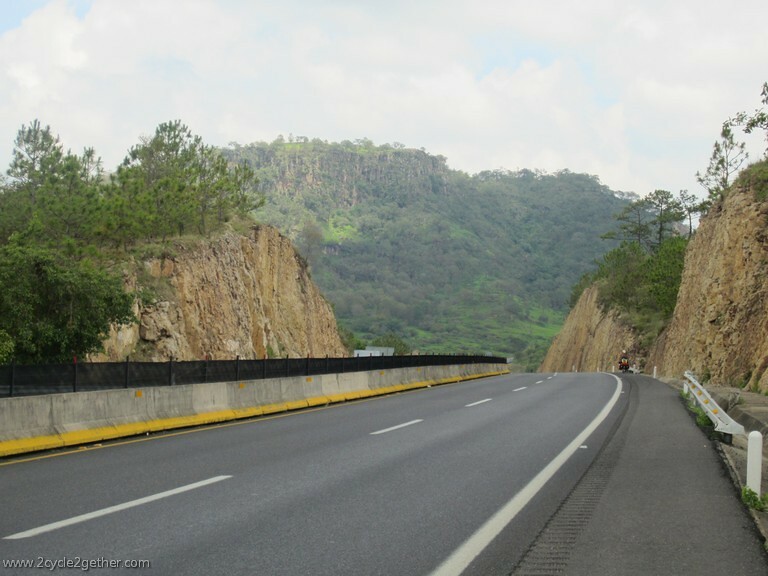 Within 10 miles of reaching Jala I begin to get excited because I know that we have a six mile gentle descent in to town. I’ve never experienced riding a descent that long and I have been holding it up my mind as a special treat of sorts. The fact that it would put a smile a mile wide on my face at the end of a sweaty day made me feel simply giddy. So, you can imagine how my heart fell when, just a 1/2 mile in to the descent, I got a flat tire! My Embarrassing Confession :: A Smart & Independent Woman Woefully Unprepared! My head starts reeling. ‘OK. OK. OK. Stay calm. Theoretically, you know how to change a tire. You can do this.” And I start unscrewing the release bolt. But then I realize I really don’t know how much I should unscrew the Pitlock stainless steel locking skewer or really how it works – it’s not like a normal quick release that I’m used to. It was then that I realize having Kai be solely in charge of cleaning and maintaining the bicycles while I was in charge of other things, like GPS route prep and maintaining our computers and our blog, may not have been such a great idea. I am woefully uneducated and unprepared! As the sun drops deeper behind the Ceboruco volcano, I finally get the rear wheel off and start to wrench the tire off the rim with the few plastic and pathetically weak tire levers I find in my tool bag. I don’t remember I’m not supposed to take the entire tire off the rim so I yank it completely off and then take the deflated tube in my hands and start searching for the mysterious puncture point by simply staring at a one inch section then staring at another once inch section, as if a hole will just magically jump out at me. Up to this point, I had tried to ignore traffic speeding past me and was trying desperately to look competent and like I knew what I was doing (ah, the ego!). But, now, I hear someone yelling so look up. There, on the other side of tall cement medians, and across four lanes of speeding interstate traffic, is a man is waving. He yells, “You’re husband’s waiting for you on the bridge! He’s about 8 kilometers down the road!” Great. Just Great. I thank them with a wavering smile. They drive on. As I pull my headlamp out of my rear pannier I start to feel queasy. I realize I’m not going to be able to change this flat on my own in the dwindling daylight and that Kai is probably getting really worried. Just then, a truck with two mountain bikes in it’s bed pulls over in front of me. A man and his son hop out and ask if I need help. Do I ever! 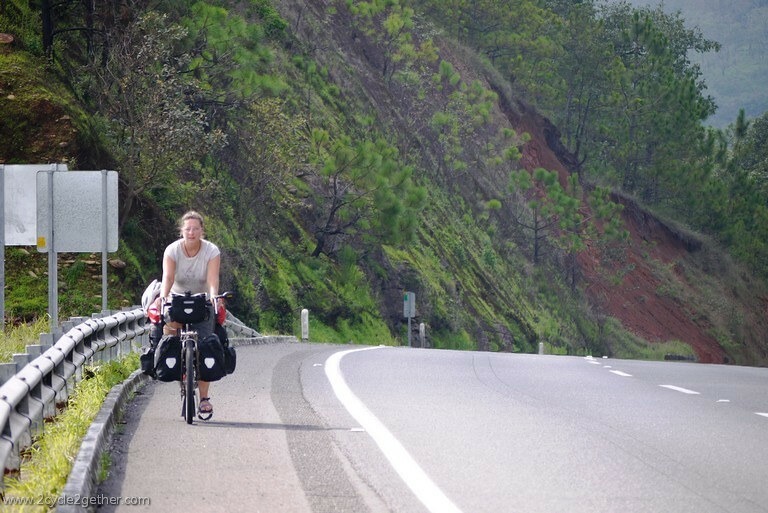 We throw my bike and my bags in the back, I profusely thank them and we commence with a part Spanish- part English discussion about cycle touring (they’ve toured through parts of Mexico). In less than 10 minutes, we meet Kai, climbing his way back to me. After we unload my bike and gear (thanks again Jorge & son!! ), Kai quickly switches out my tube and puts my wheel back in place but not without admonishing me for taking the release completely apart or for taking the tire off the rim. It’s dark by now and we’re both testy so we concentrate on racing off the highway as quickly as possible and on to the exit ramp leading to Jala. We stop at the hotel closest to the highway. The room is up two flights of stairs (requiring us to make multiple trips up and down with our gear and bicycles), has no screens (and therefore a plenitude of creepy-crawly bugs are scurrying around the room) and no shower curtain (and a shower head that squirts water all around the room so that everything gets wet). However, it does have it’s good points – clean-ish sheets, hot water & a roof. By the time we haul our gear and bicycles upstairs that’s all we need to get us through the night. Lesson Learned :: Know how to maintain your bike, even if you have a partner that likes to and offers to do it for you. You & your bicycle (and maybe even your partner) will be a lot happier if you know what you’re doing and can do it confidently and efficiently. Me on the side of the road with a flat tire. 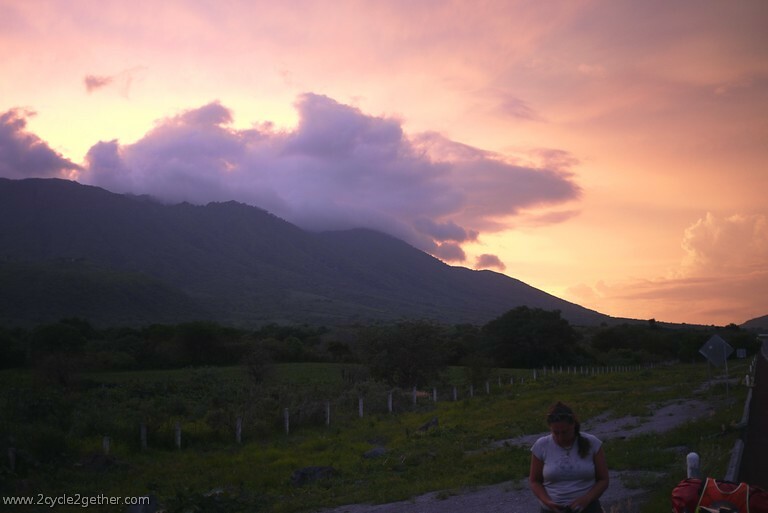 At least I had that gorgeous sunset and ancient volcano (the Ceboruco) to keep me company. 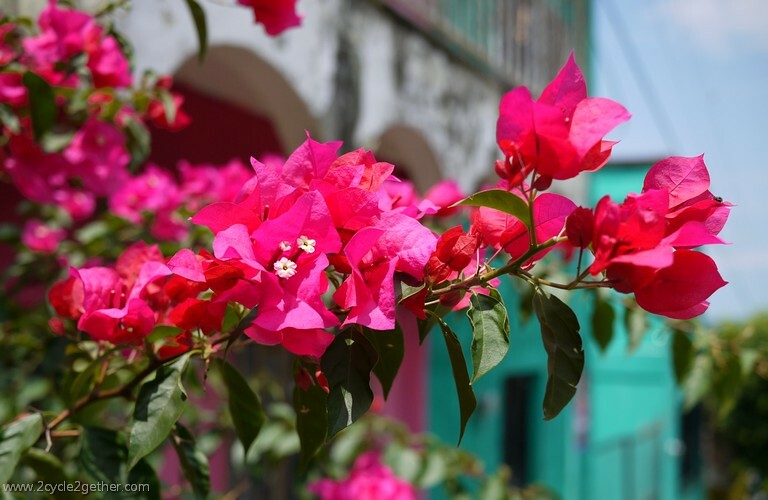 After a night of fitful sleep (I kept dreaming of bugs crawling up my nose and in to my ears), we wake early and head off toward what we thought would be our next stop – the town of Magdalena. It’s going to be a long day, over 74 kilometers (46 miles) of climbing. 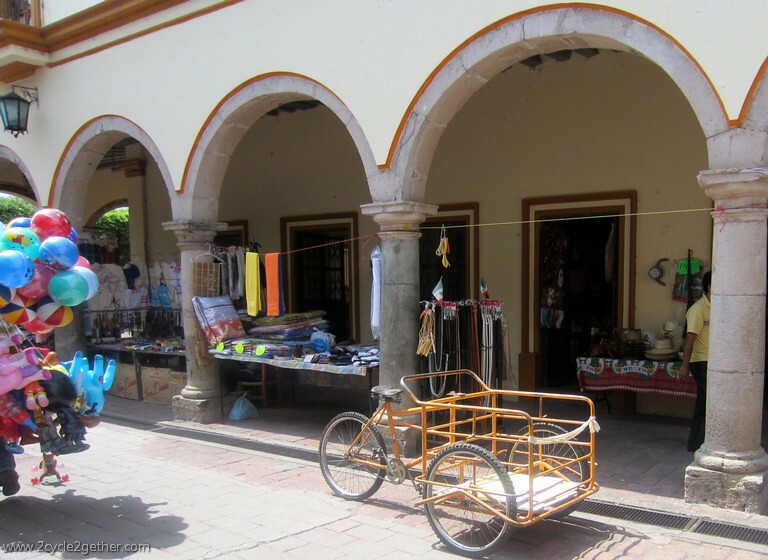 When we pull off in to the town of Ixtlan del Rio, only 17 kilometers (11 miles) down the road, to pick up food for lunch and dinner, we end up meandering our way further and further in to town in search of a mercado. 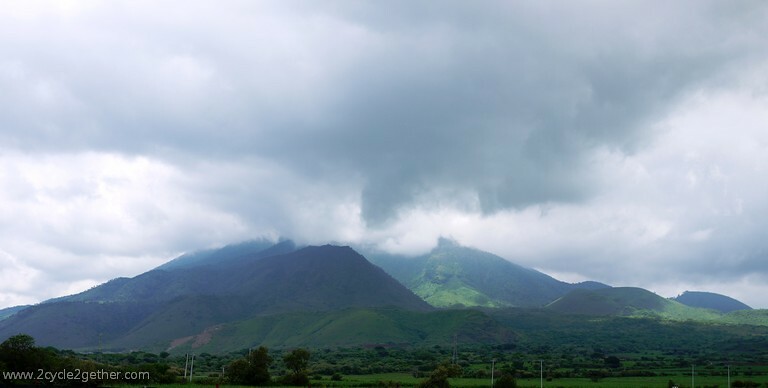 By the time we find it, threatening storm clouds are beginning to dispense large droplets, so we say, “Screw it!” and make our way to a hotel deeper in the valley. Riding out of Jala the next morning. Look at that gorgeous grass. Late lunch in Ixtlan. This is a market off the plaza. 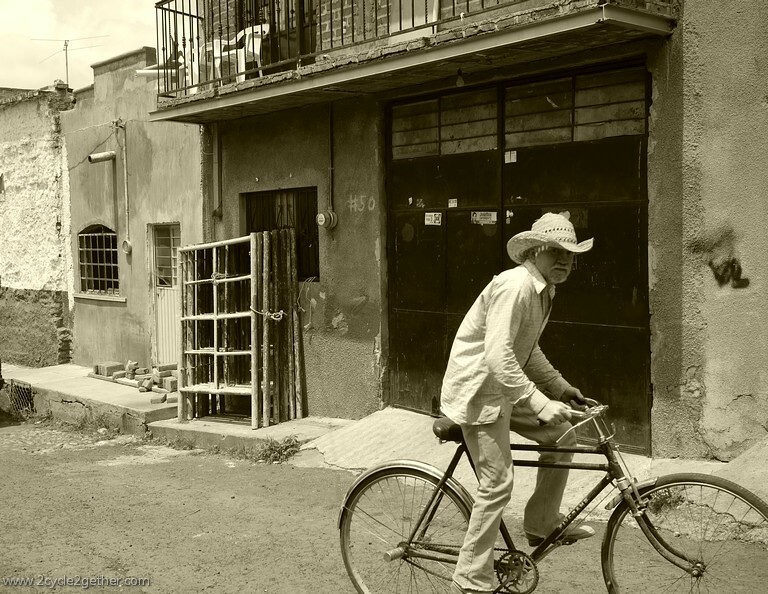 The orange bicycle – a Mexican made bicycle that roaming vendors use. We see these everywhere. 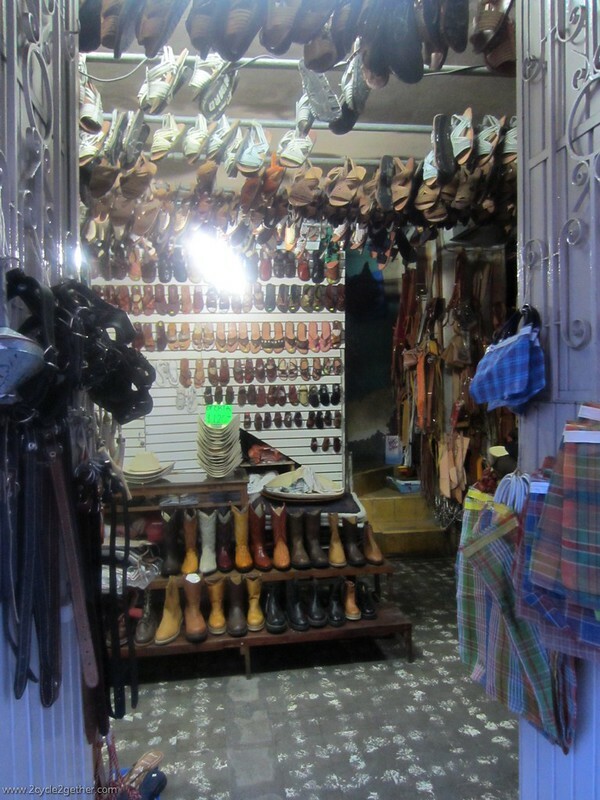 Looking in to a shoe shop in Ixtlan. 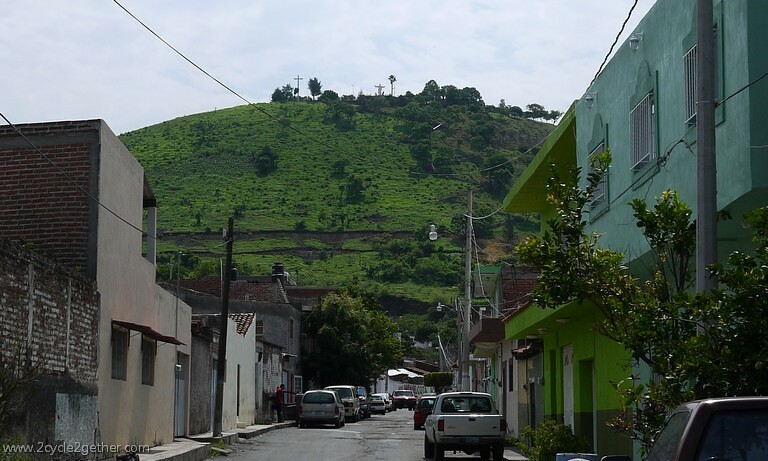 Ixtlan ends up being a sweet, bustling town and we decide to stay for a few days to take it in. We really love something about these small towns. They seem so alive and interesting, so welcoming and homey. 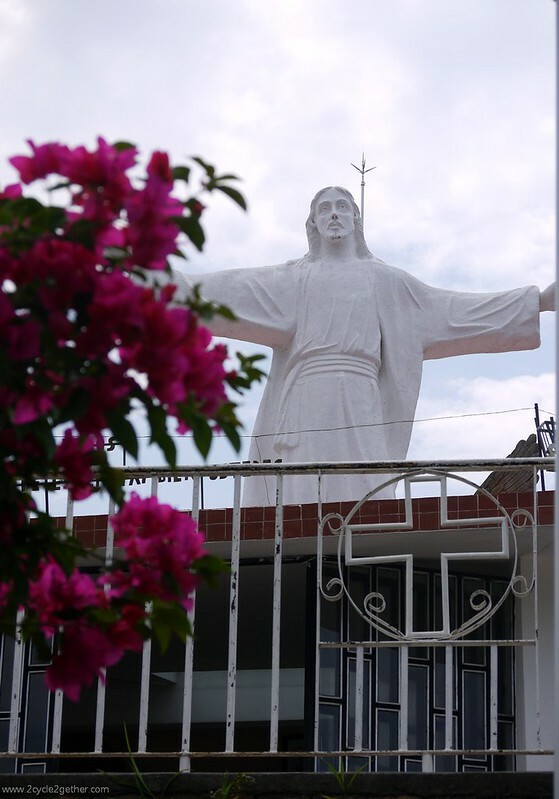 We wander the streets, climb the hill outside of town that houses a church and huge statue of Jesus on its peak and linger on the town square to listen to musicians serenade us in the evenings. We buy fruit from the street vendors, Kai gets a much needed haircut and we sleep in most days. Surprisingly, we also see several funerals over a few days time in which large groups of family and friends and a New Orleans style band playing festive music walk down the main street in town behind a hearse and a truck whose bed is overflowing with flowers. People are dressed in bright and bold colors. Some attendees, at least in one of the processions I see, hold bottles of alcohol and take long, mournful swigs of the whiskey or tequila as they swagger behind their departed loved one. Armed police men and women flank either end of the processions. As they pass, out of respect, the entire town slows and stops business and watches with saddened eyes until they are out of sight. Then, slowly, they return to their transactions, to yelling for a taxi, to laughing and chatting. And, just like that, we witness life both passing and life going on. 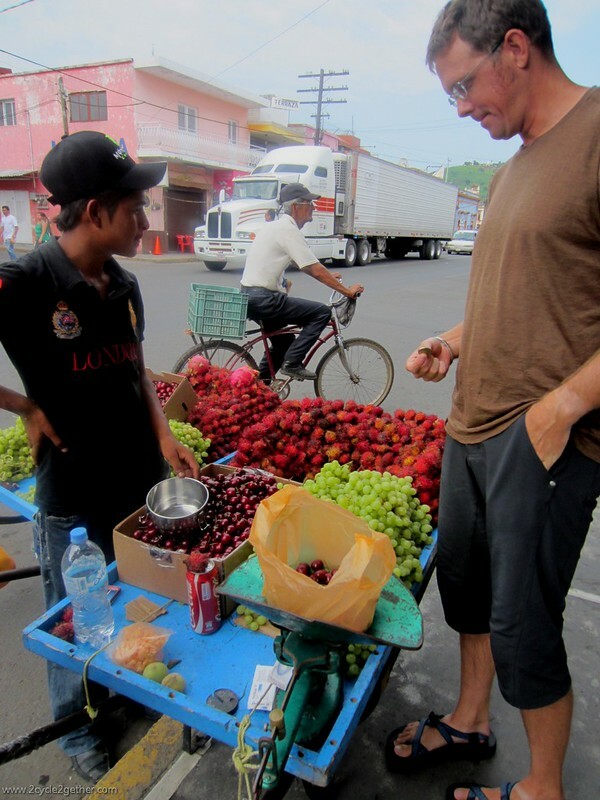 We love the fruit vendors! The fruit here is placed on a wooden table top which is tied down to a wheelbarrow. They push the wheelbarrow around town and stop at various places during the day. The church in the plaza. 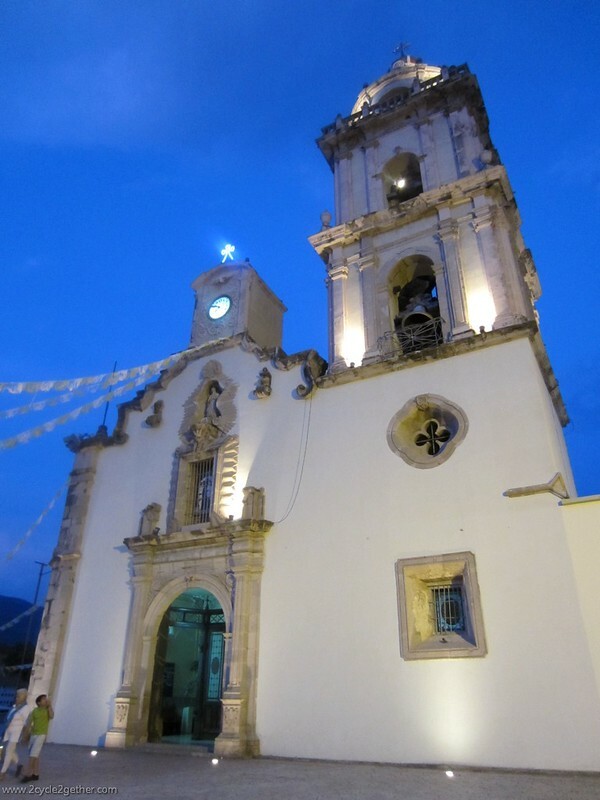 Ixtlan at night. 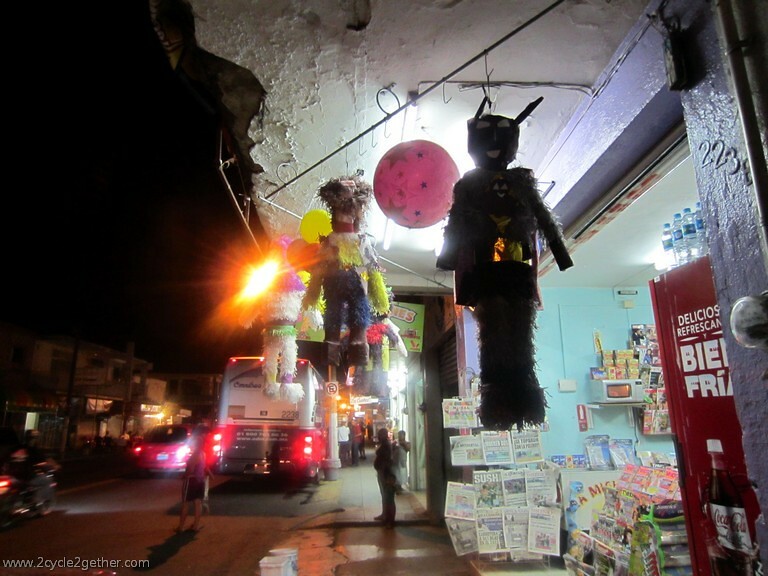 Many shops sell piñatas, many of which are “super heroes”, dressed in random outfits with sometimes funny emblems. 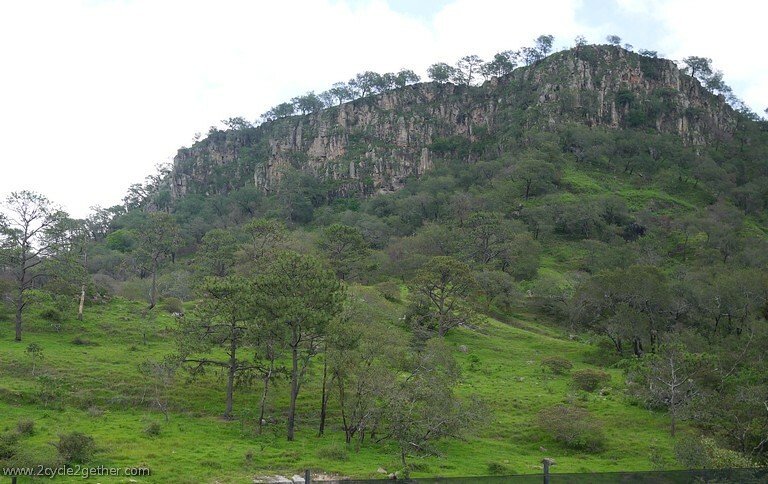 The hill of Cristo Rey (Christ the King) in Ixtlan. On the last Sunday of October, on Day of Christ the King, pilgrims and dancers gather on the hill to carry out the traditional dances of la Pluma (The Feather) and los Matachines. View of the city from Cristo Rey. Statue on top of Cristo Rey. 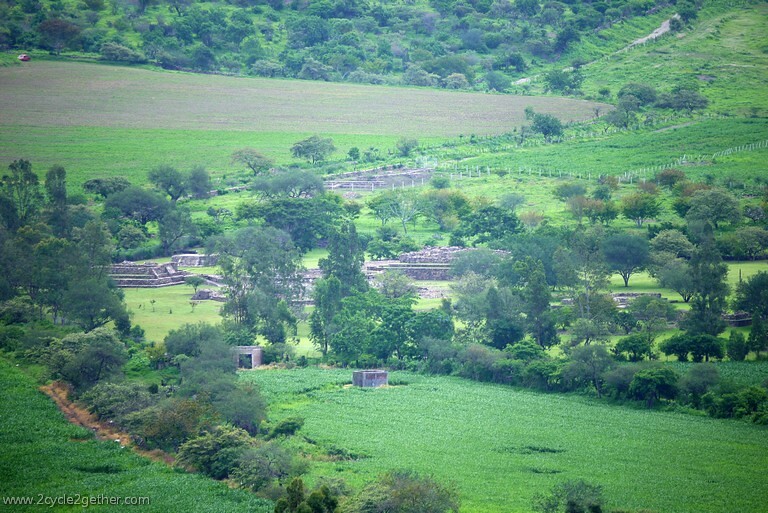 View of “Los Toriles” archaeological site south of Ixtlan which has prehispanic vestiges in the form of Petroglyphs , from the top of Cristo Rey. 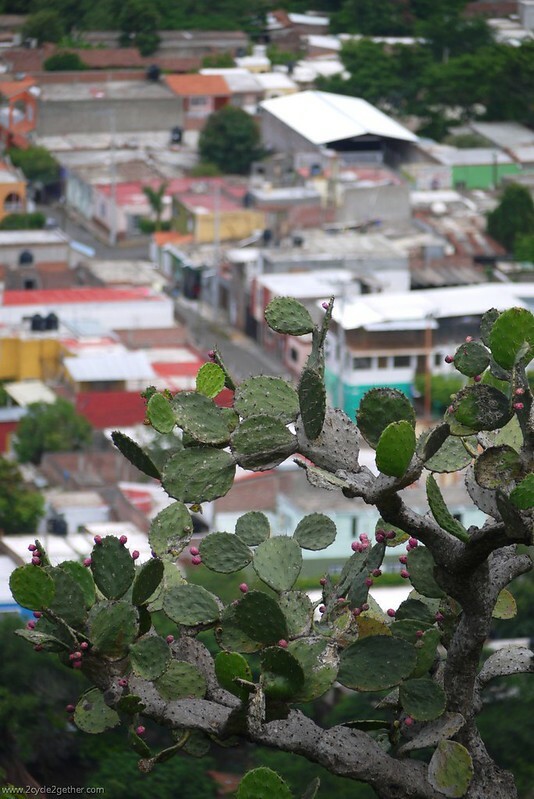 Cactus growing on the hill over Ixtlan. 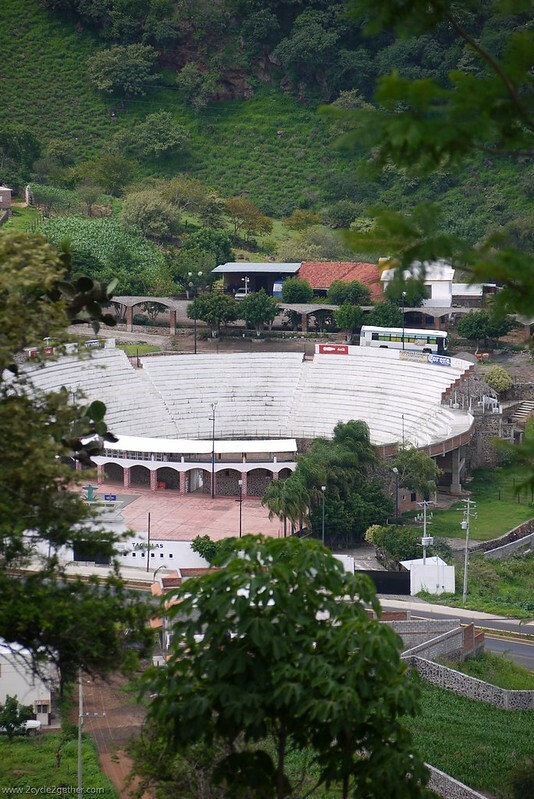 The bull fighting stadium in Ixtlan. 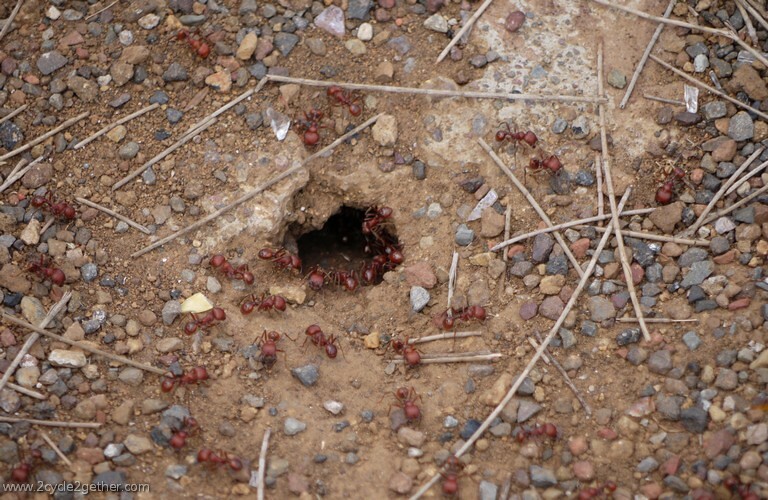 Red Ants. These buggers are everywhere in Nayarit and we often find them crawling on our feet and biting us within 10 minutes of stopping on the side of the road for a break. Love, love, love these flowers, blooming everywhere this time of the year. 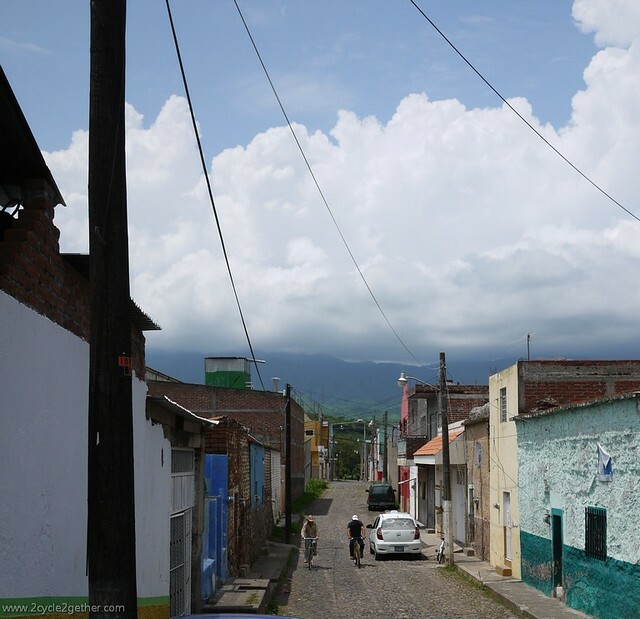 Storm clouds building over the cobblestone streets of Ixtlan. Lots of cyclists in Mexico. 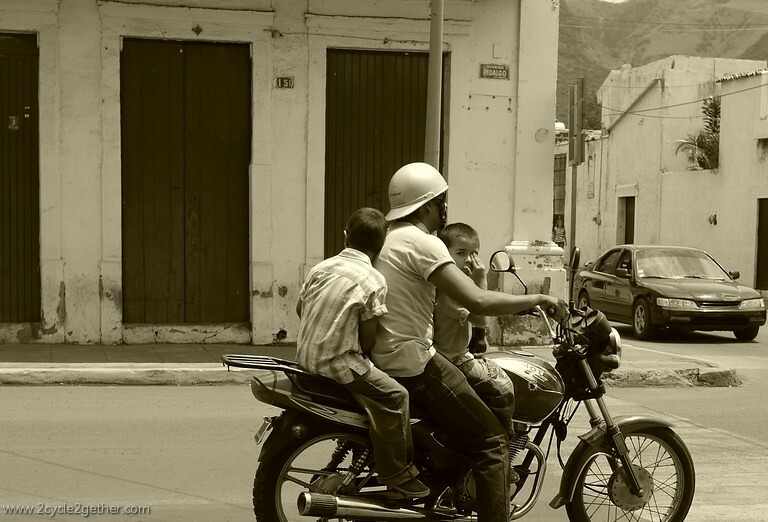 We see entire families on motorcycles here. 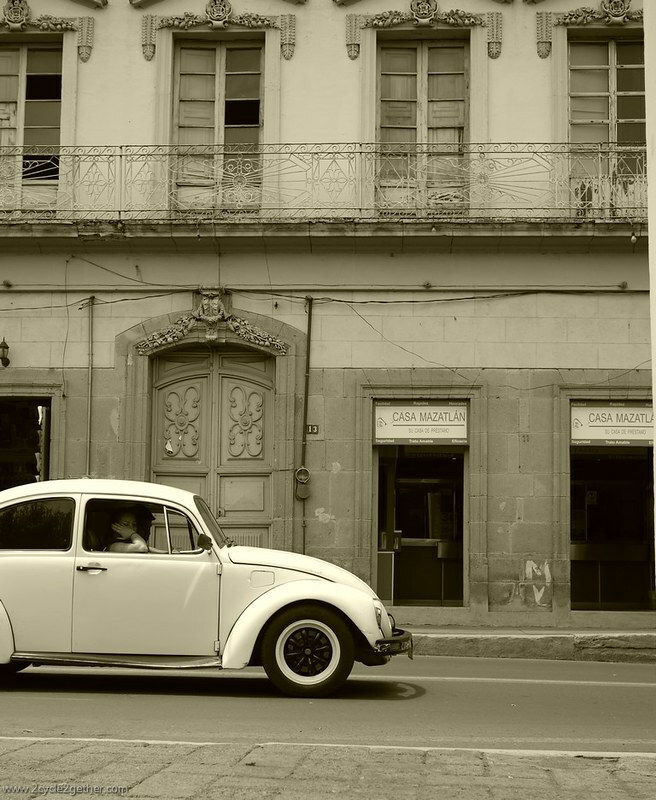 Lots and lots of VW bugs in Mexico. Looks like we’re not the only ones who love our fruit. Mango! People gather to chat in the town plaza. 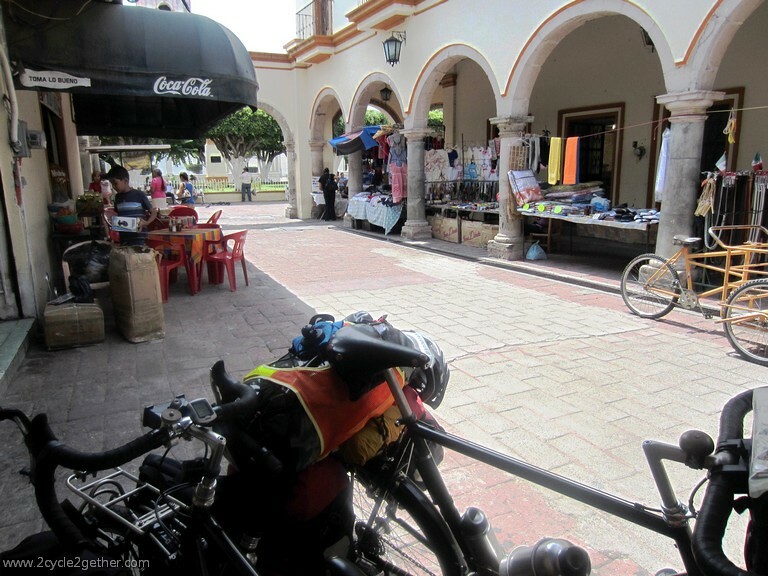 Cycling Around the World :: Tepic to Ixtlán del Río, Nayarit, Mexico from 2cycle 2gether on Vimeo. 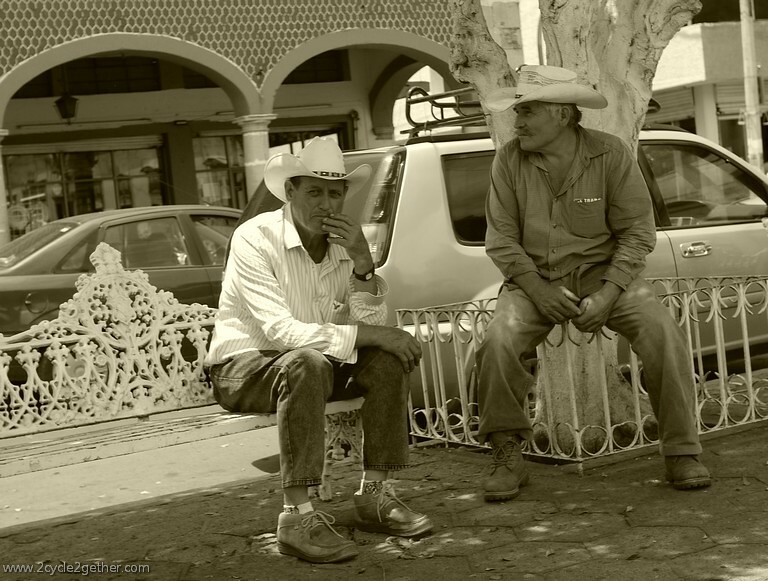 Music performed by a local band and recorded in Ixtlán del Río, Nayarit, Mexico,at the town plaza on a Sunday night. This was an awesome posting. Beautiful pictures, Sheila. Love the pictures of the flowers and of course, the statue. So what I’ve been doing is going to Google Maps and I plug in your route from city to city, then I hit the 3D option. What happens is my screen starts to show the path you guys take with all of the ups and downs on the elevation. LOT OF FUN! I’ve had the mechanical failure right at the beginning of a ride I was looking forward to (mine was a chain link popped). I could coast ok, but had to walk my bike up every hill until I met a buddy with a chain tool. The smile on his face when he showed me the tool was welcome relief, especially after the five minutes of ribbing he gave me for being so slow to catch up to him. I travel with a chain tool on every ride now. Hi Jeremy, I think that Kai’s father does the same thing with Google Earth to get an idea of what we’re seeing along the way. 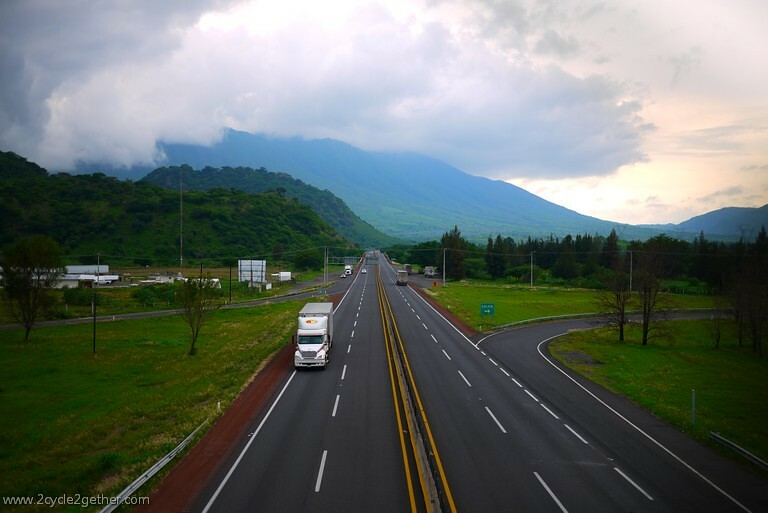 It is pretty fun to check out routes around the world that way. Hey Jeremy – I noticed today when I did a post for tomorrow that the link I include above the map at the end of our posts goes to a public profile of our route and in the summary section there’s an option to view in Google Earth kml file format. If you have Google Earth installed on your pc it should open the route automatically and then you can click on the icon to start the tour of the route, so that may be a way for you to view the route without having to recreate it in Google each time.